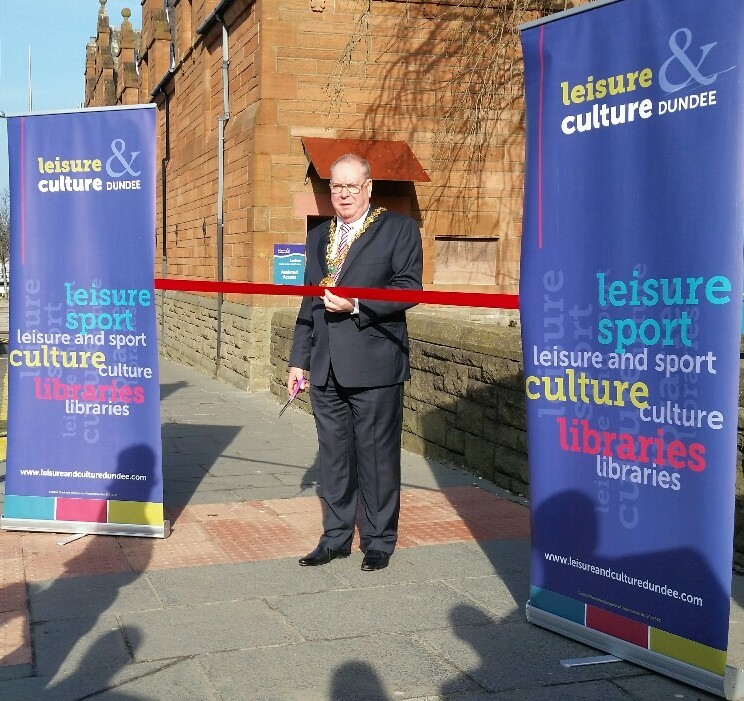 Earlier today, I had the pleasure of attending the official reopening of the Lochee Swim & Sport Centre, following its recent major refurbishment. 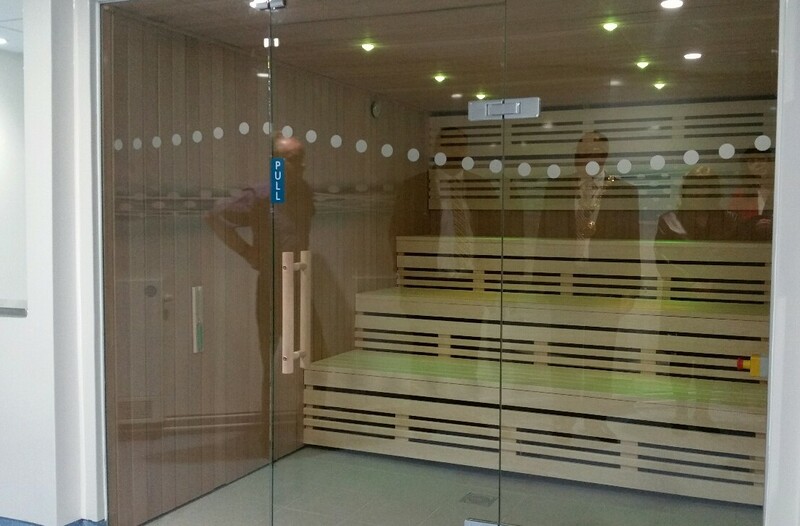 The centre has been very well upgraded and is well worth a visit – more information about facilities and opening times are available here. The Lord Provost cuts the ribbon! At council committees tonight, the committee I chair, Planning & Transport, had very positive agenda items on the regeneration of Lochee and Stobswell, together with a tree preservation order being confirmed, to protect trees and screening of industrial units on Riverside Avenue. Fairer Scotland Fund – to express concern at the £230 000 reduction in funding Dundee is receiving this year – funding that is targeted at the least affluent communities. Both I and Council Leader Kevin Keenan asked for all-party consensus to persuade Scottish Government to increase funding to the City in this area . Scottish Futures Trust – The Scottish Government’s “non profit” suggested alternative to PPP capital funding. I made the point that although I have no problem in principle with a not for profit model, the bottom line is – will the Scottish Government come up with the Level Playing Field support the previous Scottish Executive funded? Without it, Alex Salmond’s claims of meeting previous capital improvements in schools “brick for brick” will fall flat on its face. You can read this article about the plans for the regeneration of Lochee and my comments as Convener of Planning & Transport – from today’s Press & Journal – by clicking on the headline above. Any of us who actually live in the real world read with a certain amount of incredulity and a whole lot of laughter the article in “Political Diary” in the Courier yesterday which claimed Dundee LibDems “were certain of coming of coming second and had a decent chance of winning” the Lochee by-election. This is simply not true. I think we can all work out Steve’s “source”, who undoubtedly deserves a tartan P45. If Steve’s source seriously believes we thought that, from less than 7% of the poll back in May, we were going to win the seat, they are living in cloud cuckoo land. Our aim all along was to increase our share of the poll (we increased by far more than any other party and indeed Labour and Tory fell back) and put ourselves in position to have a decent chance of picking up one of the 4 seats here in the next Council STV elections. Mission more than accomplished and all credit to Chris Hall, the LibDem candidate who ran a dynamic campaign. A great future lies ahead for Chris. Steve says Nicol Stephen visited four, perhaps five times. Err, actually three times. It is not tremendously difficult to ask Nicol to visit Dundee as he drives through the city numerous times each month between his constituency in Aberdeen and the parliament in Edinburgh! The SNP and Labour poured huge resource into the by-election. SNP candidate pictured with Alex Salmond, Kenny McAskill, Nicola Cheerful … you get the picture. Labour threw everything including the kitchen sink into the by-election – I came across two Labour MSPs delivering leaflets in Charleston the Saturday before polling day and bumped into Cathy Jamieson and large Labour Team on a very wet Monday before polling day sheltering from the rain at Tesco in Lochee. Despite all the Labour effort (they had an army out on polling day) Labour fell back, the LibDems moved forward. As an aside, you get a really good value breakfast in Tesco Lochee! Some haven’t done the maths – but the party feeding the inaccuracies to the Bargeton column has. A LibDem increase of 3.9% of the poll across each ward in the City next Council elections means 2 LibDem holds plus LibDem gains in at least two further seats. The Salmond honeymoon is ending, the SNP promises galore are broken and the Dundee Liberal Democrats have never been in better shape to move forward right across the City. Attended the Lochee Ward by-election count this morning after a dreadfully cold polling day yesterday. The Dundee LibDems are delighted at our progress, with an increase in our share of the overall poll of almost 4%, more than any other party (and Labour and the Conservatives both fell back). My personal thanks go in particular to Chris Hall, our excellent by-election candidate, who worked exceptionally hard during the campaign. 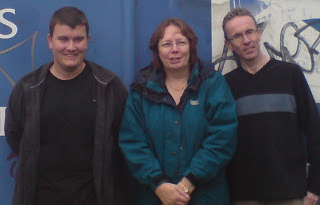 Chris is pictured with Alison McInnes, MSP for North East Scotland and myself (above right) during the campaign! A very wet Monday in the rain in Lochee campaigning at the City Council by-election. 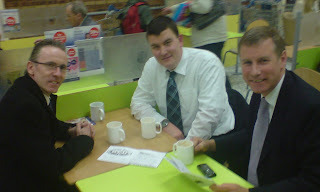 Here’s Nicol Stephen MSP, Chris Hall (Lochee candidate) and myself in the cafe at the Lochee Tesco store, escaping the rain! Tonight, at development quality committee, I moved refusal of the extension of a 24-hour take-away at the Peddie Street units, given residents’ concerns about noise, etc. A disappointing result (I lost 22-2) and in my view detrimental to residential amenity. Sunday in Lochee … and great West End photos! Our Lochee campaign team has returned home, damp, sore legs, but a great day in Lochee Ward! I have just worked out how much extra custom the Tesco cafe at the Stack is getting from the by-election… The SNP did make an appearance today in Menzieshill, but the LibDem team was in Menzieshill, Charleston, Beechwood, Dryburgh … you get the picture! Anyway, away from damp clothes and worn-out legs – click on the headline above to see some great West End photographs (South Tay Street; Nethergate) and also some of St Andrews. Nicol Stephen MSP back in Lochee Ward tomorrow afternoon – busy day ahead!